Johnny Macaroni's is still pretty new to us, even though it has been around for 10 years. Only recently discovered, this place quickly made its way onto our "excellent" list with its spectacular food and great service. Obviously, both Mom and I were excited to be going back. We pulled into the large parking lot located behind the restaurant at around 4 p.m. The parking lot is large, but fills up quickly. The entrance to the dining room is also located in the back, but there are other doors at the front of the building. We've never parked there as it's right on the street, but most people use the front entrance for their take-out retrieval. When we got inside, Mom and I were greeted by a friendly hostess who sat us at our usual table (half booth, half table) against a wall. We actually really like this seat as it's semi-hidden from the back of the restaurant. A very pleasant waitress, Kathleen, came over to our table and placed two very large, pleather-covered menus down in front of us, accompanied by a list of dinner specials and a wine list. She took our drink order - two Diet Cokes - and gave us a few minutes to look over the menu. You will definitely spend a lot of time with the menu, because there is so much to choose from. After Kathleen returned with the drinks, in plastic glasses, Mom and I were ready to order. Mom chose the cheese ravioli with a meatballs ($10.95 plus $1.50 for the meatball), and I chose the fettuccine Alfredo ($9.95). A few minutes after taking away the menus, Kathleen returned with a basket of three slices of sesame-topped bread. The bread was delicious with a crispy crust and soft middle. We couldn't wait for our meal. Everyone seems to know each other at Johnny Macaroni's. It is definitely a favorite of locals, and is very welcoming to new visitors. 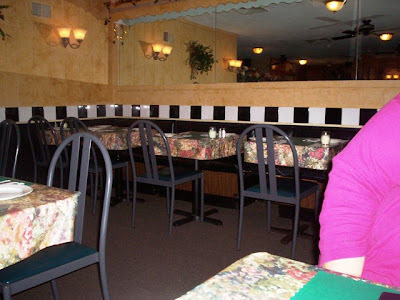 Mom and I had been to Johnny Macaroni's twice before, and each time we commented on how pretty the decor is. It resembles an Italian trattoria. With beige walls lined with black and white checkered tiles, the small building looks larger indoors than it does from outside. All the tables are decorated with plastic, floral tablecloths, and paper place mats make for an easy cleanup. In a separate dining room, there is a painted scene of an Italian villa on one of the walls that you can see through a cut-out in the main dining room wall. Surrounded by lighted ivy and wall lamps, the rooms are quite cozy, and the hanging plants and soft music playing in the background give the restaurant that little something extra. A large mirror hangs above the large bench at the back of the dining room, and the ceiling fans keep customers cool and comfortable. There are so many food options at Johnny Macaroni's. From appetizers to house specialities, everything we've had here has been delicious. One of my favorites is the chicken Florentine ($14.95), tossed with fresh spinach, ricotta and mozzarella cheeses, and bow tie pasta in a garlic cream sauce. Their appetizer list ranges from a $3.25 garlic bread to a shrimp scampi for $11.95. Soups and salads are available, along with different meats to add to your garden or Caesar salad (with chicken - $9.95; beef tips - $11.95; teriyaki shrimp - $14.95). 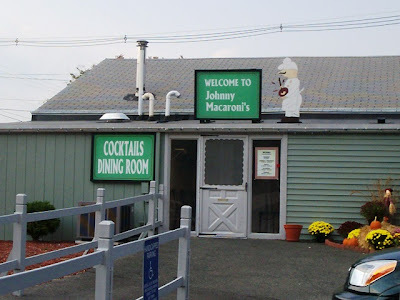 Johnny Macaroni's has a large list of burgers and sandwiches such as the veal parmigiana ($9.95), prosciutto with fresh mozzarella tomato basil ($7.95), and the eight ounce black Angus beef burger ($6.95). All sandwiches and burgers are served with fries or cole slaw. Seafood choices range from dishes like fried scallops ($13.95) and broiled scrod ($13.95), to more intricate dishes like the baked stuffed jumbo shrimp ($15.95) and the seafood diavolo (with calamari - $11.95; shrimp - $15.95; scallops - $16.95). Grilled marinated sirloin tips ($13.95) and Christoforo's steak ($24.95) are two of the delicious choices listed under beef, and all entrees are served with veggie of the day and a choice of rice, potato, or ziti with tomato sauce. Lunch is served until 3:30 p.m. on Tuesday through Friday, and both prices are listed on the menu near each item. You can also choose to Pick-A-Pasta , where you'll get your choice of spaghetti, linguine, ziti, bow tie, fettuccine, or angel hair pasta with either tomato, garlic and oil, diavolo, marinara, or butter and cheese sauce for $7.95. If you choose to try the vodka tomato cream, mushroom, meat, or cacciatore sauces, the dish will cost $9.95. Add a sausage for $1.75 or a meatball for $1.50. Special requests and substitutions may have an additional charge. Some of their house specialities include the baked ziti ($10.95); Uncle Abb ($19.95), which is veal and chicken scallopini with jumbo shrimp, sauteed with mushrooms and prosciutto in a savory marsala wine sauce, served over linguine, and topped with mozzarella; Bona Bocca (chicken - $14.95; veal - $16.95), which is a breaded veal or chicken cutlet sauteed with mushrooms, onions, and marsala wine, topped with Genoa salami, fresh mozzarella and served over pasta; and the Festival of Italy ($15.95), which includes chicken parmigiana, lasagna, and a meatball. A catering and take-out buffet menu is also available for all your party needs. The handmade calzones are just one of the featured items. It didn't take long before we noticed Kathleen coming over with our meals. They both arrived steaming. Mom loved her ravioli. She said that it was obviously freshly made and delicious. The raviolis were nicely filled with cheese and not watery in the middle, and they were cooked perfectly al dente. The sauce was not bitter at all - it was actually a little sweet. The meatball was delicious and very well cooked. The entire dish was served nice and hot, and the portion was a good size. My fettuccine Alfredo was out of this world. 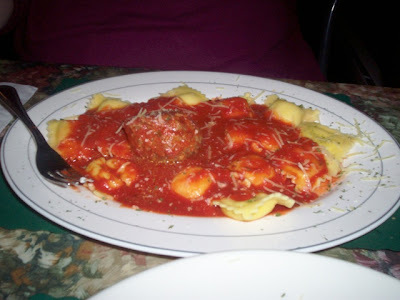 Normally my favorite place to get this dish is at Magoni's in Somerset, MA. However, the Johnny Macaroni's version was just as good - if not better. 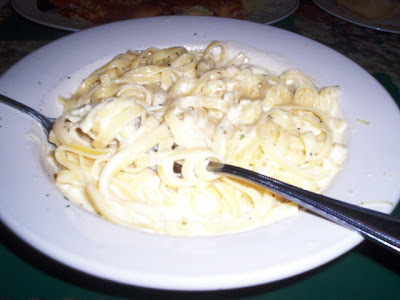 The cheesy Alfredo sauce was thick and plentiful, while the fettuccine noodles were fresh and had a great texture. The portion was huge, and I was sad to leave a few forkfuls behind, but there was just no room left. I was full and deliciously satisfied. On our second visit to Johnny Macaroni's, I ordered the antipasto ($9.95). I, unfortunately, did not care for the taste of the marinated eggplant. This never happens. I called the waitress over and apologetically told her that I would not be finishing my dish. Instead of making a huge scene, the polite waitress was very sympathetic and immediately took back the antipasto and removed it from the bill. She offered me something else from the menu, and I chose an appetizer of toasted ravioli ($5.95). I was not expecting them to be so kind to me after not liking the taste of their marinade, but they were very obliging and were quick to try and resolve my issue. People rave about their antipasto, and although it was good, the marinade wasn't a flavor that sat well with me. This is just my personal preference. If you're a marinated eggplant fan, definitely give it a try. We left $33 on the table, including a 20% tip for Kathleen because she was an excellent waitress. She was also our waitress on our very first visit, and she was just as great then as she was now. Before leaving, Mom and I stopped at the ladies' room. Although the ladies' room was beautifully decorated and clean, there is only room for one. Customers have to wait in line in order to get inside. This normally wouldn't be a big deal, however, the area where the bathrooms are is also the area where the waitstaff hangs around. Add that to the customers waiting in line to get to the restroom, and you will have quite a pileup in that small area. We left Johnny Macaroni's around 5 p.m., happy and stuffed. Both Mom and I are big fans of Italian cuisine, and paired with our fantastic dining experience, we will definitely be keeping this restaurant on our "excellent" list. 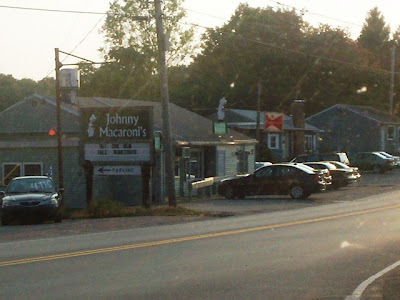 Johnny Macaroni's is open from 11:30 a.m. to 8:30 p.m., Tuesdays through Thursdays; from 11:30 a.m. to 9:30 p.m. on Fridays; 3-9:30 p.m. on Saturdays; and 3-8 p.m. on Sundays (closed Mondays).